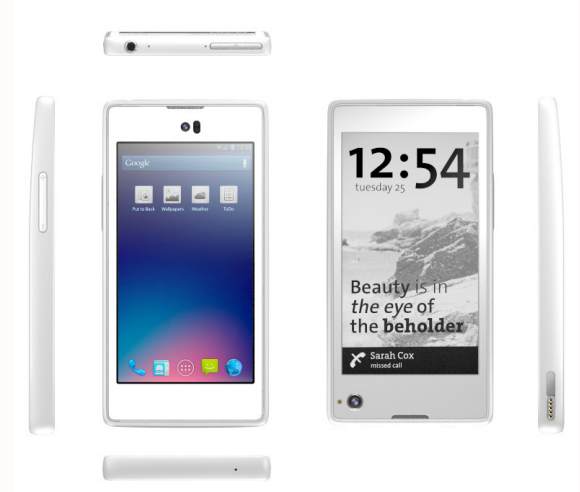 The Russian company will launch in late 2013 Yota Devices dual screen smartphone. On one side a smartphone classic, the other one reading electronic ink. Perhaps he will soon have with Russia on the smartphone market innovative. The company Yota Moscow Devices has just unveiled its Yota Phone which has a unique feature: it has two screens. On the front, the LCD "classic", in color, with a resolution of 720 x 1280 pixels, allows you to access all the features of a smartphone classic. On the back is a reading light, a screen with electronic ink, 200 dpi. It is very convenient because it is very energy efficient and requires only little battery to operate. Even when the smartphone is fully discharged, the reading light allows you to view the last recorded image. On the other hand, it is possible to drag documents downloaded from front to back. This part of the phone can also display the last SMS that has not responded or its notifications on social networks (Facebook and Twitter). The screen reading light, black and white, is more relaxing for the eyes. Both screens of 4.3 inches, come with a Gorilla Glass: scratch-resistant glass. The thickness of Yota Phone is 10 mm and its weight is 140 g. Jelly Bean running Android 4.2, Yota Phone is equipped with a 1.5 GHz dual-core processor Snapdragon S4, a 2 GB RAM and a storage capacity of 32 GB. Since May, 35 engineers worked in Yota Devices on this model, with a meager budget of 25 million dollars. The Russian company, founded by Vladislav Martynov, announced the launch of its flagship product by the end of 2013 in Russia, and in some European countries. She hopes to sell a million copies in 2014. This smartphone hybrid should be sold around 550 euros without subscription. Two Russian operators have already ordered the newcomer on the market of mobile telephony.